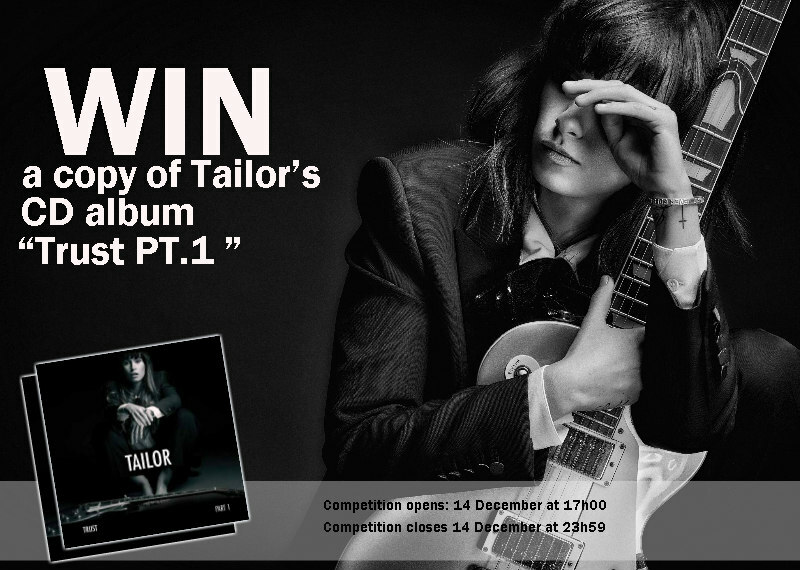 Stand a chance to win a copy of Trust PT.1” CD Album by Tailor! Entrants must SMS EXPRESS, name and city to 33650! 1.1. The Afternoon Express “TRUST PART 1” Album competition (Competition) will be run by Cardova Trading (Pty) Ltd in association with Tailor (Organisers/we/us/our). Entries for the Competition will open at 17h00 on Wednesday, 14 December 2016 and will close at 23h59 on Wednesday, 14 December 2016 (Competition Period). 4.1. SMS the keyword "EXPRESS" followed by your name, surname and city to 33650 within the Competition Period. 6.1. The Winner will receive a CD copy of Tailor’s album, “Trust Part 1” (Prize). 6.2. The Prize excludes all items not mentioned in clause 6.1. 6.3. We will contact each Winner per telephone to obtain address details and to make arrangements for delivery of the Prize. The Prize will be delivered to each Winner per courier, or as otherwise discussed, to an address within the Republic of South Africa within 30 (thirty) days from the confirmation of the Winner. 7.6. We reserve the right to amend these terms and conditions during the Competition Period at our sole and unfettered discretion should we deem it necessary for any reason. 7.7. We will need to process your personal information to validate your entry, to contact you for marketing purposes, as well as to contact you, if you are a Winner, to make the Prize available to you. By entering this Competition, you specifically and expressly consent to us processing your personal information for these purposes. 7.9. Once the Winners accept the Prize, such Winners accept such Prize voetstoots and at their own risk. 7.10. We assume no liability whatsoever for any direct or indirect loss, harm or damage arising from your participation and/or any use of the Prize awarded in terms of the Competition. All persons, entering this Competition, indemnify and hold us harmless for any loss, damage, harm, death or injury (whether arising from negligence or otherwise) which may be sustained as a result of his/her participation in this Competition and/or his/her use of the Prize, or the use of the Prize by a third party.